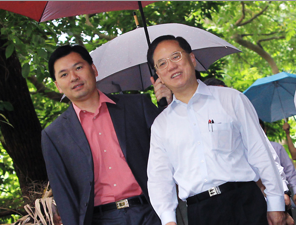 The news (and Private Beach) reported how HKSAR Chief Executive Donald Tsang Yam-kuen took part in the global car-free campaign on Wednesday 22 September by “shunning his chauffeur-driven limousine - and walking to work”. So instead of taking his usual chauffeur-driven limousine, good old Donald decided to take his chauffeur-driven umbrella to work. Furthermore, it appears his brolly is attached with all the latest mod-cons such as a standard-issue police pistol, satellite mobile phone, cigarette lighter plus a very handy suit jacket stand. What more can our privileged chief executive want? Apart from his limousine, that is. The partial release of the long-awaited official report from the Philippines government investigating the ‘tragicomedic’ event on 23 August has probably added more fuel to the fire. Is there a silver lining to all this? There doesn’t appear to be, although it is somewhat surprising that no Chinese media or even individuals have mentioned the really super “lucky” numbers that are associated with the Manila hostage crisis. Remember, Chinese protestors will not fail to use slogans such as “six-four” (6/4) to represent the June 4th Tiananamen incident massacre or “four-four” (4/4) for the April 4th movement. Anything that enhances Chinese traditions and superstitions will be unashamedly exploited. Fung Shui masters are especially adept at doing this, and the media must also take responsibility for propagating such silly beliefs and superstitions. But for the Manila ‘tragicomedy’ no one, it seems, has noticed or at least publicly acknowledged the super “lucky” association with “eight-two-three” (8/23) along with the “eight deadly blunders”, not to mention the number of fatalities? As morose as this post may seem, this is just an illustration of the cherry picking that is involved whenever people use superstition and traditional beliefs to support their cause … as opposed to rationality. We can’t have it both ways: if people choose to use numbers to confirm their biases, then there should be no complaints if conflicting evidence also appears. 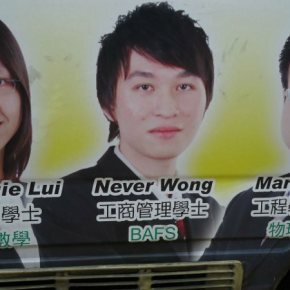 This blog makes no apologies when it states that the Manila hostage crisis happened on an extremely auspicious-sounding date, 23 August (8/23), and eight Hong Kong Chinese people were killed. Oh, and the official Philippine investigation report is 84 pages long. Is there a silver lining to all this? Here’s another example of football pluralism creeping into the vernacular. 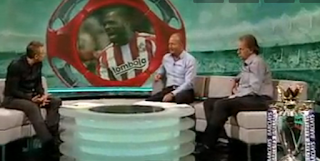 On BBC’s Match of the Day last weekend, host Gary Lineker and pundit Mark Lawrenson are discussing Arsenal, following their 1—1 draw at Sunderland in the English Premiership. Lawro: Have they [Arsenal] still got a soft centre? Can they win the league? Lineker: I suppose the real test will be where they fell down last year, against the big teams. Against the Chelseas and the Man Uniteds they just got pulverized didn’t they? Lawro: Well yeah and if you remember Chelsea played their football almost as well as Arsenal and they were so much more physically strong that they absolutely dominated them. Let’s see how many other unsuspecting people within the football fraternity (like Gary Lineker) start to use pluralism. This blog loves peculiar names and a couple of European labels caught the eye in a news story about cheating amongst mountaineers. Or was this a case of altitude sickness causing amnesia? The names are: Austrian "skyrunner" Christian Stangl and Romanian climber Zsolt Torok. The latter (i.e. the whistle-blower) sounds like a Romulan Praetorian from Star Trek and the former (i.e. the cheat) sounds more like a “dangler” rather than a skywalker or skyrunner. Austrian "skyrunner" Christian Stangl, who was bidding to become the first man to conquer the two highest summits on each continent, did not in fact reach the summit of K2 in August as claimed, Austrian media reported. Stangl, 44, never even left the base camp, let alone climb the world's second highest peak, the daily Oesterreich reported, citing Romanian climber Zsolt Torok, who was on K2 at the same time. "The guy did not even leave base camp but just went away, camped for two days, read a book ... and then came back at 6am. He told us then that he'd reached the summit," the Austrian daily quoted Torok as saying. On Tuesday, Stangl admitted that he had never reached the summit of K2 on August 12, as claimed. "I was in a trance-like state and thought I had reached the summit," he confessed at a press conference. A photo he claimed to have taken at the top of K2 was actually taken at 7,500 metres (24,600 feet) altitude, some 1,000 metres below the summit, Stangl also said. But even that was false, according to Torok, who ascended K2 on August 13 and said he saw no traces of Stangl's climb. "It was clear that nobody could have climbed there before me," he was quoted as saying in Oesterreich. Stangl said Tuesday that fear of failure had altered his perception and it was only after the fatigue had let up on his return to Austria that he "became more and more aware" that he had not reached the K2 summit. The Austrian was seeking to climb the two highest peaks on each continent - Europe, Asia, Africa, North and South America, Antarctica and Oceania. After his alleged K2 conquest, the only remaining summit on his list was the 4,852-metre Mount Tyree in Antarctica. 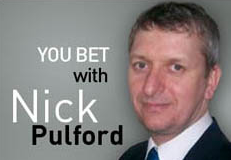 Nick Pulford has a great weekly sports column called You Bet in the SCMP. However, his mugshot has a rather off-putting veneer and puts a damp squib on proceedings. Perhaps it best to remove the mugshot, so that readers can focus on the column’s content which is usually an interesting read? He was looking so like a halibut … I might have supposed myself to be gazing on something a.w.o.l. from a fishmonger’s slab. Q: Anyone know where that famous line comes from? 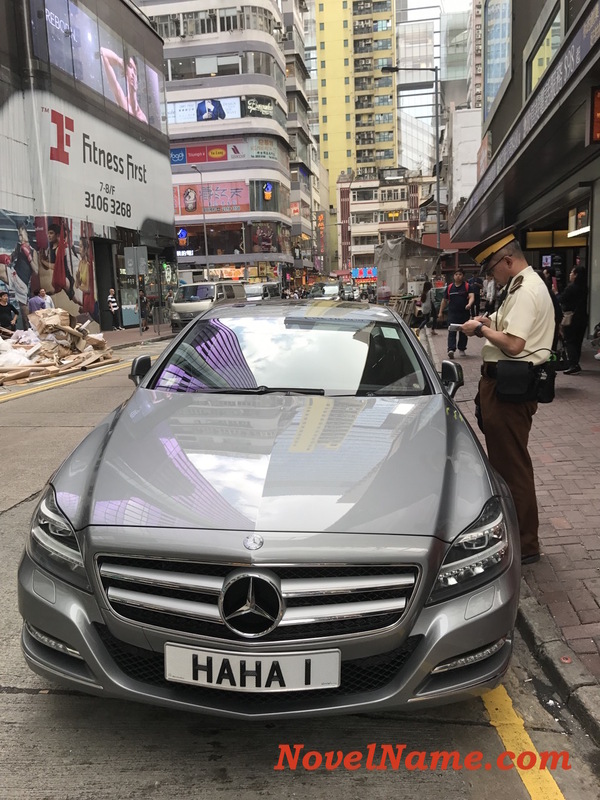 Disclaimer: As mentioned in About HK Doppelgangers, no offence is intended, and any resemblances are entirely due to one’s own perceptions shaped by experience and exposure to life’s wonderful social diversity. 9/11 today, so this is a rush job on a post with an nth degree of Kevin Bacon and Muhammad. Somehow, I don’t think sales of football shirts do a roaring trade in countries like Qatar, Oman or Iran. 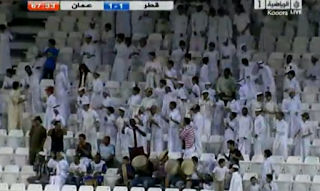 Unless of course the women, who are prevented from attending live matches, are huge supporters and wear soccer shirts under their burqas. Can you tell which team this set of fans support? Away home away fans, I think. Photo from a recent match between Qatar and Oman. Even one in eight Macedonians (according to a convenient poll) wear football shirts to matches!